Musings on design, music, life in New York City and pics of Sophia Petrillo the cat. I put on a BrightTALK webinar this morning for my employer, Akkadian Labs. I talked about the 3 key steps to creating an adoption plan when your company wants to deploy a collaboration technology. Check it out! You need to register for BrightTALK in order to view. However, BrightTALK is a free service and actually pretty helpful when you want to research a topic in HR, marketing, or IT. It's not many small businesses who can hire PR firms. Yet, press releases are a great way for small businesses to get their names in front of local or pertinent news outlets. I've put together a basic outline that one can follow to write a press release in the instance that your business has received an award. There are many different ways to write a press release but you should make sure that you include a headline, summary, link to your website, a quote and contact information for someone at your company. Length: Shorter is better. Keep under 70 characters. Who, Who, What: State what the award is all about. Who won, who gave it, and what the award is for. Length: Make it one sentence. This is the portion of the press release where you delve into why the award matters. Try to explain why the award is newsworthy and why anyone should care. Is it because the organization giving away the award is super special? Is it because the good work that you did is so noteworthy? Focus on the more newsworthy aspect and explain. Ask yourself, "why would anyone care?". Quote the highest ranking person at your company. Write the quote for the exec and then have him or her sign-off on it. Have the quote answer these questions in a succinct way: Why does he or she care about the award? What does it mean for the company? Add a little more detail to the work you did to get the award. Or, add a brief statement about the history of the award. Has anyone famous in your industry ever won it? Was it named after someone? Go a little deeper into details (while staying succinct) than you did in the first part of the body. If possible, grab a quote from the organization giving the award. Why was the organization impressed by your work? If not, add a 2nd quote from your company's executive. Leave the reader knowing what to do next. Is it to visit your company's website? Start a new paragraph with a header, "About [Insert company name]." Under this heading, briefly explain the services your company provides. When quoting someone for the first time, you should refer to him or her by the full name along with his or her title. Every time after that, simply refer to him or her by last name. Headlines should be in present tense. The rest of the press release should be written in past tense if the events have occurred in the past. Don't use a fancy word for "said" when you are quoting someone. News stories relay information without amplifying emotions. For example, don't say someone shouted, or yelled, or exclaimed. The overall tone of the piece should be neutral. Your company's executive may sound exuberant and excited, but outside of the quotes, neutral language should be used. You don't want the press release to sound cheesy or like an advertisement. Too many exclamation points and fluff seem disingenuous and people won't take it seriously. 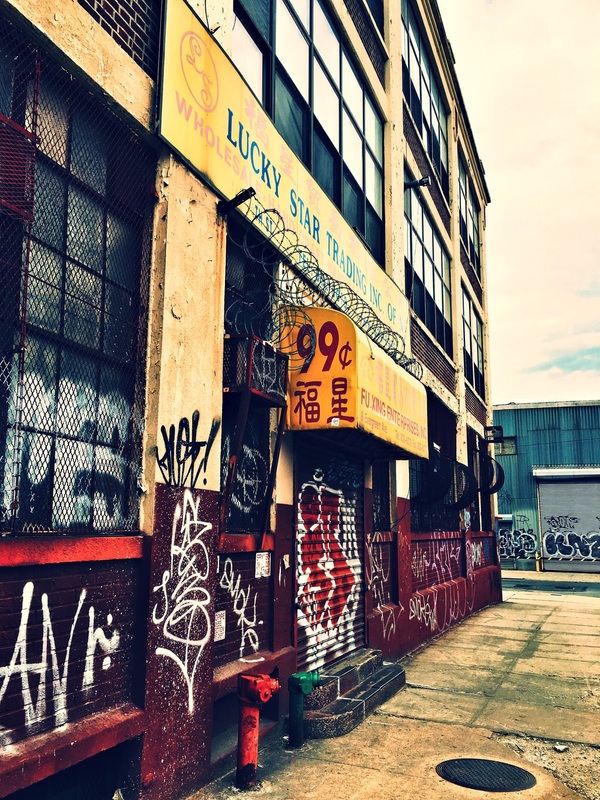 I usually spend Sunday afternoons in Bushwick, Brooklyn. Here are some pics from near the Morgan L stop that I took over the weekend. The wheat paste murals were too torn to see the artist signature. 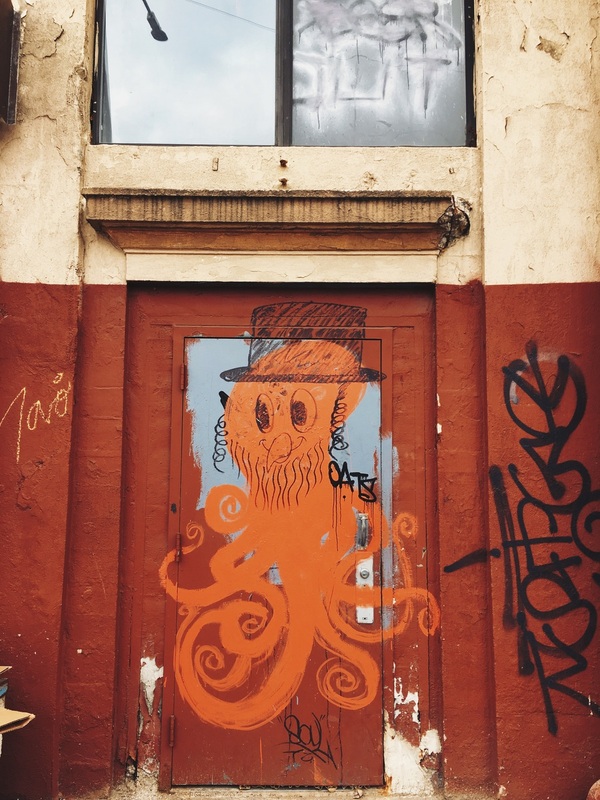 This octopus man sort of reminds me of Mr. Peanut--very fancy. A little like Abe Lincoln, too. He's in a constant state of almost annoyed with me, which I think I capture here. I spotted this TitusAndromedon.com flyer on Macdougal in the Village. I checked it out. The flyer is advertising a Netflix and refinery29 sponsored screening of Unbreakable Kimmy Schmidt at BAM on Thursday, March 31, 2016 at 7pm. Clealrly, I reserved 2 seats. Small business owners are often experts in their respective fields who have opened a business; they can't be experts at everything, right? Yet, given small budgets and staff, they feel pressure to be a marketing expert. As people take to the web to search for solutions, even a brick and mortar store’s success relies on customers’ abilities to read about the store on the web. This means that small business owners need to understand a few basic things about SEO in order for their businesses to stand out. I find that many small business owners are overwhelmed by the research on SEO that's available. It seems that the field has grown so big, and so deep that it can be exhausting when all you want is an intro into the idea of SEO and optimizing your own site for Google searches. I’ve outlined a couple of core concepts to help those looking for a basic overview of SEO for a small business. To me, if you understand what Google is trying to achieve via SEO rankings, then it makes building a site with SEO in mind more intuitive. The most important thing to understand about Google search rankings is that Google wants to be useful. It wants you, the actual human being, to find answers that satisfy you. If Google stopped being useful, then you would stop coming to it for answers and it would not make money. Thinking in these terms, what makes sense for Google to use as evidence that your site gives the answers? It’s going to look for relative content on your site using the search terms you’ve used. Those search terms you type into the search field, or keywords in the SEO world, become very important. Google looks through websites and looks for those keywords. In years past, people would jam as many keywords onto a page as possible, as if yelling at Google, “look at me! I’ve got a LOT to say about this topic!” As you can imagine, people found these pages cheesy, disingenuous and not helpful. Google noticed, changed its algorithm, and stopped rewarding keyword stuffing. While it may seem tempting to do this, there’s a much more time-effective strategy for inserting keywords into your content. Google tries to read a website’s content the way a real person reads content. Have you noticed how when you land on a page, you skim the headlines, looking for the article or part of the article that meets your needs? Google does the same thing and looks for keywords to appear in headers and subheaders. When you break your page’s content into pieces, it becomes more in line with the way people are navigating sites. Label these pieces with their main points in short, succinct phrases. When Google “crawls” your site, it notes these headings/subheadings and the terms you’ve included. In theory, Google rewards these pages with a higher ranking. Besides scanning a page’s headlines, visitors also scan for images. Images are another important element to a webpage that small business owners need to consider. The best images illustrate or support the content on a page, giving the visitor an at-a-glance overview of what he or she is going to get from reading the content. This helps guide the reader to continue reading, as well as break-up the page so it seems navigable. Images make people happy with your page, which makes Google happy. Remember, Google doesn’t want people to be frustrated while visiting a page it recommended. One thing that frustrates people is when the page does not render properly; there’s content there, but you just can’t “see” it. Therefore, in the instances that images don’t load, Google wants the visitor to at least see an explanation of what the image depicts. Moreover, the seeing impaired use screen readers to read webpages. If images are not properly labeled with titles or alt text, the screen reader is unable to describe the image. Google rewards pages with “alt text” tagged in the image. Small business owners should take care to label all images with descriptions. Adding alt text to Wordpress images is a very simple process and you are probably already seeing the field every time you’ve uploaded an image into your Wordpress site. Again, Google doesn’t want you stuffing keywords everywhere; the best thing you can do to optimize your alt text for SEO is to be honest and accurate in its description. You want a short, succinct description that is not too broad. A five to seven word phrase works well. Think about your ideal client that your page is trying to reach. What questions does your page answer for the client? How does your image illustrate these points? This should be the image alt text. Simply labeling the image your keyword is probably not accurate, probably more broad than what is actually going on in the image and most likely won't be rewarded by Google. Unlike working with alt text labels in Wordpress, I did not find it intuitive the first time I tried to add alt text to uploaded images for a Squarespace site. So, here’s some advice. For Squaespace sites, if you are uploading single images, the file name becomes the alt text. Therefore, it is important that your file name is not just a series of numbers or letters, but that you’ve put thought into which alt text label you would like to use before you upload your jpg. If you are uploading to Squarespace as a gallery, the alt text is the image title. Putting some time into describing your images’ contents before uploading your Squarespace images adds a few more minutes and steps to your uploading process, but it is worth it. Investigating and researching new, atmospheric places to eat is one of my hobbies. Adding difficulty to this task, which I happily face, is the fact that I do not eat gluten. I was diagnosed as gluten intolerant in May 2005. In the past 11 years, I've developed many tricks to locating places to dine that offer gluten free options. 1). Go to Yelp from your laptop or desktop computer; if you use your phone, just make sure you are using a browser. The Yelp app for tablets and phones is not as useful in finding gluten free options. I will explain why later. 2). To start, find the search bars at the top of the page. In the right bar labeled "near" enter the part of town in which you want to dine. In the left field labeled "find" enter the search term "gluten free." 3). Navigate to an individual restaurant in the search results. Now, this is where the desktop site becomes important. You want to see the context in which the reviewer used the term gluten free. For example, if enough people say "I wish there were gluten free options," then that restaurant lacking in gluten free options will make it into the search results, as in the example below. Searching within all the reviews for the term "gluten free" will give you insight into the quality of the results, as well as the types of gluten free options. The full version of the website offers a search function where you can once again search "gluten free" from all the results on this individual restaurant. The app version does not have the search function. 4). If I like what I read about the restaurant after searching for "gluten free" in the reviews, I bookmark the restaurant and note that it is gluten free, as well as add the details I learned from doing the more in depth search. I have many bookmarks with "gluten free pizza only" or "gluten free buns" or in very rare cases, such as with Senza Gluten, "entirely gluten free menu." This way, when I'm out and about in NYC, I can use my phone and the app. I simply look in my bookmarks for the best gluten free options nearby. I've been gluten free for 10 years, and I have found this method to be the fastest, most efficient method in locating gluten free dining options. Yes, there are gluten free specific websites out there that some people use to guide their dining excursions, but nothing can beat the collective blogging power of every Yelp review ever. I am constantly discovering places with gluten free options that I never would have if I didn't periodically use this method. Another method of finding out about gluten free dining in New York City is by following me on Yelp. I recently returned from a very relaxing vacation where I flew from NYC to Denver. In Denver, I met my good friend Camille where we picked-up our rental, a fiery red Mustang convertible. While in line at the rental place, we overheard they had overbooked their convertibles. True, the clerk tried to entice us to switch to a hardtop Mustang or Jeep Wrangler. We were not to be dissuaded from our original inclination that the entire point of our Rocky Mountain adventure was to take in the natural beauty of surroundings—we wanted our freakin’ Mustang. We would have accepted another form of convertible sedan, but a Jeep Wrangler is bumpy, loud and not as pleasant a ride. We, along with our friends following our exploits on Facebook, were tempted to refer to us as “Thelma and Louise” but to be honest, neither one of us have ever seen the movie and have no idea which character we preferred to be. While in Denver, we checked out some of the gluten free and vegan dining options (and there were many), rented B Cycles, took the Banjo Billy Bus Tour and hung out inside the newly renovated Union Terminal. We were both impressed by the sophisticated refurbishment of Union Terminal; it both looked like a train station circa 1900 and a hip coffee shop/bar/beer hall in 2015. Besides Denver, we spent a few days in Breckenridge, as well as visiting Boulder and the Rocky Mountain National Park. The convertible really came through for us on these winding mountain roads. In fact, if I lived in Colorado and wanted to take a drive through the Rocky Mountain National Park, I would still rent a convertible to do so. Now that spring is in the air, I'm looking forward to walks on Roosevelt Island. I enjoy the peace and calm of the tiny East River island, as well as the views of Manhattan. One of my go-to meet-up spots in the East Village is Cafe Mocha--it's sort of the Central Perk of the East Village. There is a large outdoor table area, as well as a nice sized dining room. Cafe Mocha, while serving food and wine, is definitely a coffee shop at its soul. Some places you'd feel like a total tool taking up a table and only purchasing a cup of coffee. That's ok at Cafe Mocha. The cup sizes are generous and I always think of So, I Married an Ax Murderer. One of my favorite things to do is explore the city and find under-the-radar spots with lots of character. I hit a landmine when I stumbled into a little storefront restaurant in Greenpoint. I used my Yelp app to search for the nearest byob option. I saw there was a Polish spot I'd never heard of nearby. While what attracted me to Lomzynianka (now closed) was the byob option, what told me I'd love this place was the sound of someone hacking at a piece of meat in the kitchen. Luckily, there's also a window view right into the kitchen and I could see the woman vigorously chopping with a heavy knife. I immediately felt like this place was for real and I was about to taste some homestyle cooking. The wood paneled walls and VFW style tables, complete with a mounted deer head on the wall, intensified my expectations. I was not disappointed. One of my favorite subjects is NYC on a rainy night. We've had a few this summer where I was able to capture some colorful sidewalk reflections and silhouettes. Larger-than-life color blocking in black and white was so big in the early nineties, just like my graphic above. One of my goals this summer was to dress more like 1993…and I’ve been taking that goal one step further by living like it’s 1993 (or about then). 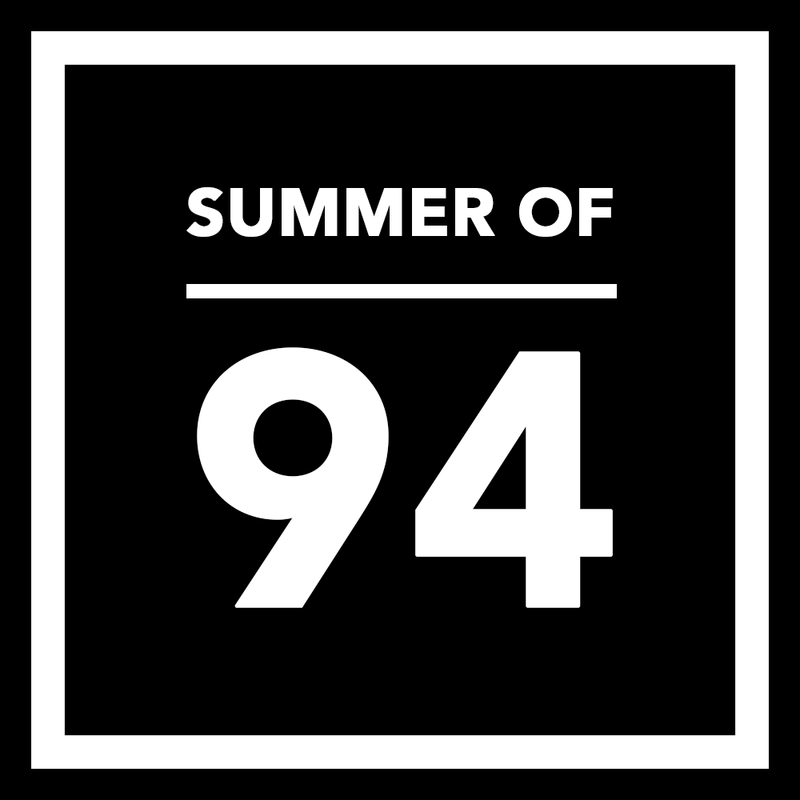 The summers of 93-94 were epic years for pop music and WNYC’s Soundcheck radio show has been celebrating with its “Summer ‘94” series to celebrate the 20-year-anniversary of many cornerstone hits. It is hard to believe, but it has already been twenty years since we first heard Lisa Loeb’s Stay, Beastie Boys’ Ill Communication, Nas’ Illmatic, and Jeff Buckley’s Grace. Yep, the Sabotage video is 20. So, not only have I been soaking up every Soundcheck piece on ’94, but I’ve been listening to early 90’s releases on my Spotify and iTunes whenever I get the chance. Also, I read Here we Are Now by Charles R. Cross about Kurt Cobain’s lasting legacy. Yes, he died 20 years ago. I have been so busy this summer! My latest adventure was on Tuesday night when I attended a cooking class at Astoria Bier and Cheese on Ditmars Blvd. The class was put on by Kim Calichio, a local chef who has a company called KC Culinary Events. She offers private cooking lessons and events. The evening was a great opportunity to spend some time outdoors in a way I never I thought I would. The cooking demonstration was set-up on the back patio of Astoria Bier and Cheese that is absolutely charming. The table was already prepped and staged with all the ingredients. Kim was very friendly and approachable and welcomed questions as she demonstrated. The class focused on rubs and marinades. I’m a pretty good home cook, but I’ve only dipped my toes into the world of spices and rubs and I learned a ton in this one evening. She started off by showing us how to cut up a whole chicken into leg and breast pieces. One of the key tips I learned is that toasting your whole spices before grinding them makes everything amazing. She demonstrated this by coating a pan in olive oil and pouring in layer of whole coriander. The scents were out-of-this-world. The Astoria Bier and Cheese staff was amazing as well, letting everyone try the pumpkin ale that was used in the marinade. The shop will probably be hosting more events like this in the coming weeks. Besides listening to lots of 1994 albums, another way I've been living like the early '90s is by Rollerblading! I utilized a Summer Streets event in Manhattan where Park Avenue was closed from the Upper East Side, all the way to Lafayette and then on to the Brooklyn Bridge. We Rollerbladed as everyone else (besides maybe 6 other 'bladers") walked, jogged or biked. At first I was so terrifyed that I was getting passed by runners. I don't think I've been on Rollerblades in 8 years. But, after a few minutes, I loved it. A cool feature of the Summer Streets event was getting to blade through the grand central terminal roadway that is normally only opened to cars. It sort of wraps around the building so you get really cool views you wouldn't normally see. As my About Me section illustrates, I have an artsy family. Today I opened an email from my sister Anna with a graphic she had made to share with us advertising the Jeff Koons: A Retrospective exhibit at the Whitney. This graphic wasn't intended for any sort of dissemination; it was just meant to inform her sisters and husband about the exhibit. I love how excited she is about art! Since I moved to New York about two years ago, I've kept a bucket list of things I'd like to experience, which includes a waterway cruise around Manhattan. Most of the other to-dos involve warm weather, outdoor activities that range from "obvious" to "I've lived her all my life and I've never heard of that." An evening cruise probably falls into the "obvious" category, but it is something that even life-long New Yorkers should experience. The views are out of this world! It is easy to get caught up with the hustle and bustle and forget how connected to water this city is. I took the the "Thirsty Thursday" cruise from Circle Line; a friend purchased about a dozen tickets in a clump and secured a low price of $18. The event is geared toward the young professional crowd, with dance music and bar right on the deck. There was picnic-type food for those who didn't eat before for a nominal price. Our event wasn't very well attended, which was fine for us because we really just wanted to soak in the views; a crowded party atmosphere wasn't what we were after. After spending a few days in Ohio and Northern Kentucky visiting relatives, I am back in New York. Obviously, the highlight of my trip is spending time with my nephew. 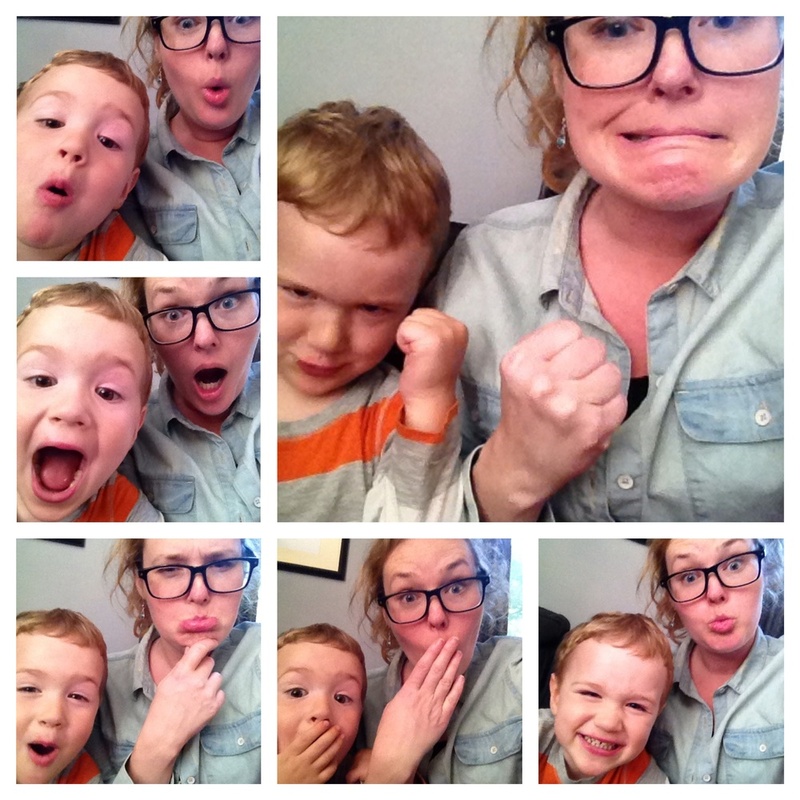 He is very imaginative and we had lots of fun making dramatic faces. I followed his lead in the below. We stopped by the first of the summer street fairs in the area, the Maifest in Covington, Ky, just over the river from downtown Cincinnati. The most impressive thing about this festival is the huge selection of fair foods and German sausages. Also worth mentioning were the competitive chalk drawings, a random mural of Andy Warhol, the crazy things people will deep fry and consume, and the excellent bourbon bar along the fair's main drag.